Waist Trimmer. Lying down, grasping handles and using foot pedal, raise up via abdomen strength. Doing sit-ups via the band set. Leg Training. Lying down, raising legs around 90 degrees and using foot pedal and handle, shoulders close to the ground and keep fixed, doing knee bend/unbend exercise. Arm Training. Stand up-right, adopting pedal and handle, pull up tube sets straightly. Shoulder Training. Sit on chair and bend knee about 90 degrees, keep full body upright. Adopting pedal and handle, pull up handle. Comfortable for use. Full set is ergonomic design comfortable feeling when using handle and pedals, soft foam material is also burden free. Sweat proof. Both handle and pedal parts are made of NBR foam, breathable and can absorb part of sweat. Offers cool exercise. Compact & Durable. The four resistant tubes are made of natural latex, each of which owns strength of 6 lbs, the whole set can bears around 25 lb strength. Ultralight. NBR foam and latex tubes are all with light weight and soft, it is pretty convenient to carry it out for gym work or travelling, ideal exercise equipment for indoors and outdoors training. Soft & Durable Material. Both handle and pedal parts are made of NBR foam which feature with spongy and soft characteristic, pretty soft and comfortable for use. At the same time, the tension tubes are made of 100% natural latex with PBA free and non-toxic, the four tubes set is capable to bear 25 lb strength, compact and firm for daily use. Sweat proof & Anti-slip.The unique NBR foam is sweat absorbent and breathable, both handle and footrest are design by ergonomics owns handy feeling and non-slip . Lightweight & Portable. 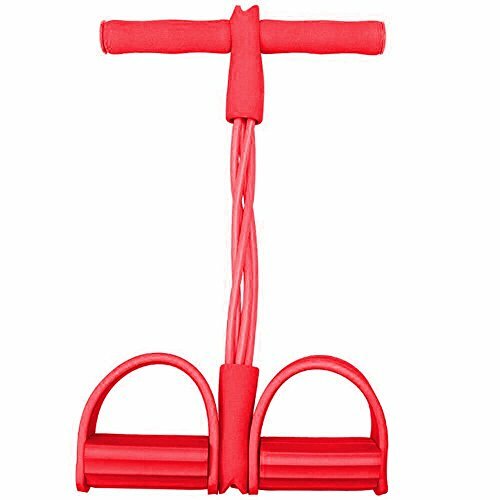 With ultralight weights and foldable size this resistant tube exerciser is much convenient to be carried out, meanwhile, as a home exercise equipment this set can be used at anywhere there can standor lie down. Ideal product for daily training. Workout for full body. The intended use is to train abdomen and legs muscles by doing sit-ups via this resistant tube set, also when you change other postures and add this set you will find it will be much easier to train full body core muscles. Multifunctional.Training with the resistance bands may not only assist with rehabilitative exercises, fat loss, building muscle, but also prevent of getting cervical spine and lumbar pain, maintaining a healthy body for you. If you have any questions about this product by Nochim, contact us by completing and submitting the form below. If you are looking for a specif part number, please include it with your message.